Author(s): Ali Burak Ozkaya, Handan Ak, Sevcan Atay, Hikmet Hakan Aydin. Ege University, School of Medicine, Department of Medical Biochemistry, Bornova, Izmir 35100, Turkey. Lipogenesis is considered to be a very important aspect of cancer metabolism and targeting de novo lipid synthesis or related pathways are among novel approaches to treat cancer. Many targets of the pathway including ATPcitrate lyase (ACLY), acetyl-CoA carboxylase and fatty acid synthase have been evaluated for their potential in cancer treatment. However the role of citrate transport protein (CTP), another important component of lipogenesis pathway, is not well known for cancer metabolism and cell survival. Here we report that while chemical inhibition of CTP reduces cytoplasmic citrate levels and limits breast cancer cell viability effectively, siRNA based inhibition had little effect on both. We also compared the effects of CTP inhibition with ACLY and found that the inhibition of ACLY reduced cytoplasmic citrate levels and limited cell viability more effectively than CTP inhibition. Finally we have demonstrated that neither cell cycle arrest nor autophagy was induced in cells treated with CTP or ACLY siRNA. Inhibitions triggered apoptosis but only slightly. Growth inhibitory effects do not occur in normal mammary epithelial MCF-10A cell line. Keywords: ATP-citrate lyase, cancer metabolism, citrate transport protein, histone acetylation, SLC25A1. Affiliation:Ege University, School of Medicine, Department of Medical Biochemistry, Bornova, Izmir 35100, Turkey. Keywords:ATP-citrate lyase, cancer metabolism, citrate transport protein, histone acetylation, SLC25A1. Abstract:Lipogenesis is considered to be a very important aspect of cancer metabolism and targeting de novo lipid synthesis or related pathways are among novel approaches to treat cancer. Many targets of the pathway including ATPcitrate lyase (ACLY), acetyl-CoA carboxylase and fatty acid synthase have been evaluated for their potential in cancer treatment. 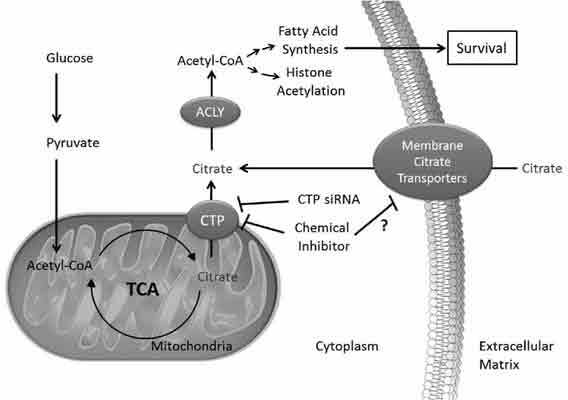 However the role of citrate transport protein (CTP), another important component of lipogenesis pathway, is not well known for cancer metabolism and cell survival.